Each year my students tend to fall for the same mistakes when filling out college applications. 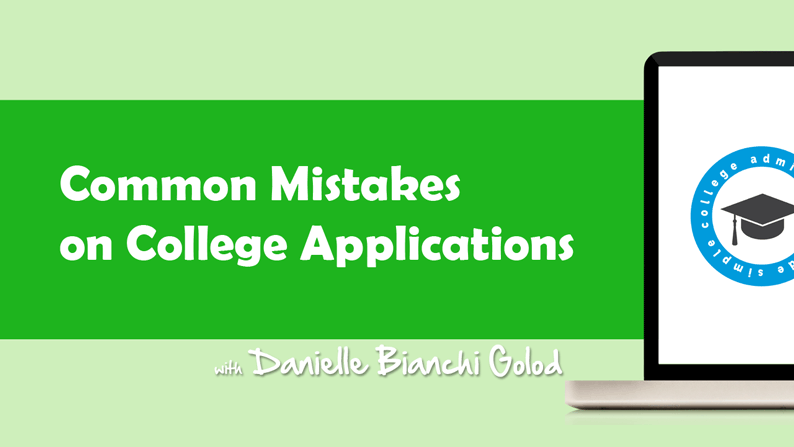 Because the UC, Common Application, and many others have not yet revealed their 2011-2012 Fall application, I will base these mistakes on past years’ applications. Most will still apply for the next application season, do don’t you get caught making the same mistakes! Some students will write the wrong scores or use the pull down menu on the online application incorrectly. Many students will even add scores that are lower than what they have on their AP, SAT, ACT, or SAT Subject tests. Of course the schools will receive your official scores from the College Board or the ACT, but this is the first thing they see on your application, so make it right. When it comes to AP tests, many schools won’t require the AP scores until you decide to go to their school. So make sure these scores are written correctly on your application! I once had a student write a “3” when she got a “4” which is a big difference when it comes to placing out of a college course. (4’s and 5’s tend to be the only scores which can place a student out of an entry level course in college). In the past, the UC application has given the student an option to check boxes for possible scholarships. I promise, there will be a lot of boxes that pertain to you. Don’t skip this section. This is potentially a chance for you to get free money from alumni! The UC and some other applications have students divide their activity resume into sections. Try to have something written in most of these sections. Obviously don’t make up anything, but if you have an activity that could work across a few sections like Educational Prep Program or Volunteer Work or Extracurricular Activity and you’re heavy in one section and have nothing in another, then divide them up a bit. Many student essays, once they’ve been cut and pasted onto the online application, show up with odd formatting. This is usually because people have indented or put dashes or used italics. These don’t transfer into the applications very well. I’d advise you not to use dashes & italics in your essays & activity resume. Instead of indenting to signify a new paragraph, just press return and have a space between paragraphs. Make sure you upload your most recent version of your essay! You’ve most likely gone through multiple editions of your essay with me or on your own. I have found that students mistakenly upload an old version that didn’t have the corrected grammar or vocabulary or punctuation. Make sure your final version is your polished version. Favorite food?A very common answer I hear each year is: “steak,” “pasta,” “salad,” “frozen yogurt.” At least explain what kind of steak—from your mom’s kitchen or a specific restaurant. “Grandma’s steak au poive” or “steak at team dinner” gives a little more of a story than just responding “steak.” “Mom’s Fusilli with Mushrooms” is a better answer than “pasta.” “Salad” leaves us wondering. What type of salad—Chef? Greek? Cobb? One you make? “Frozen Yogurt” could be anyone. “Strawberry-Vanilla swirl with rainbow sprinkles” shows us a little pizazz. Favorite Activity for FunIf it’s hiking, biking, walking, swimming, yoga, etc…explain where, when and with whom just to give a little bit more about you. Greatest inventionIf it’s the phone, camera, computer, calculator or car, just know that everyone else said that too. I’m wagering that “Facebook” will take the most generic response this year. As always, when it comes to all these common mistakes, the best advice is to start your applications early so that you aren’t careless. The more time you have, the more thorough and creative you can be. I submitted my UC application last night. When I review my essay in the application, it shows storage question marks at the beginnjng of each para. Maybe due to indent I added at beginning of para. How do I fix this. I am really worried. As you have probably figured out, there is no way to change the essays once submitted. Sometimes formatting typos happen when you cut & paste…and weird question marks and such can show up. However, this wont be the first time the UC’s will have seen this, so you can feel ok that it happens more often than you’d think.